Land Rover has introduced the long-wheelbase Range Rover and new range-topping Autobiography Black spec. The former – the first long-wheelbase Rangie since the LSE of the early 1990s – will debut at the LA and Guangzhou shows before the end of the year. Lengthening the bodyshell in front of the rear wheels yields an extra 140 mm of rear legroom. Autocar UK says overall length is now 5,200 mm (a 200-mm jump). Offered with either bench or individual Executive Class rear seats, the second-row executive-style seats can recline to 17 degrees (eight degrees more than the standard-wheelbase model), while a feature called Passenger Seat Away slides the front seat forward to provide additional space and comfort. The stretched fourth-gen Range Rover comes with subtle ‘L’ badges behind the front wheel arches, powered side door blinds, a panoramic sunroof and increased stowage as standard. The long wheelbase will be offered on Autobiography and Autobiography Black models. A hybrid derivative will arrive later in 2014. The wraps are set to come off the new Range Rover Autobiography Black early next month at the Dubai show. A product of Jaguar Land Rover’s ‘Engineered To Order‘ (ETO) division, the Autobiography Black gets unique design finishes on its front grille and side vents along with black enamel and chrome badging. There’re also 21- or 22-inch seven-spoke wheels in a high-gloss polished finish, signature rear lamps and auxiliary vents, and a tailgate with chrome accents. 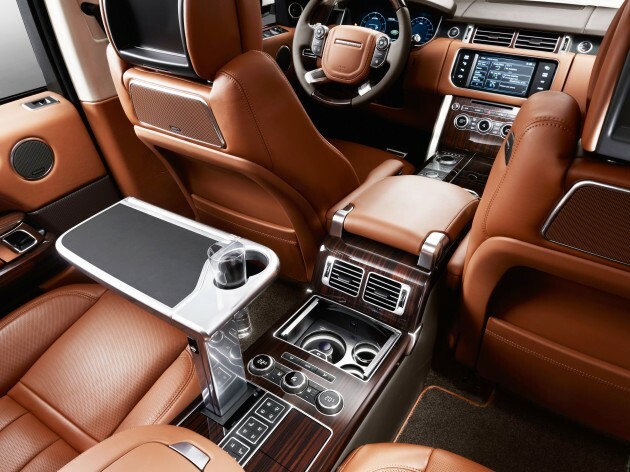 Specify the Executive Class seating package here and you get unique seat covers, two individual fully-adjustable rear seats, 10.2-inch screens in the front headrests and a Meridian sound system. A redesigned rear centre console incorporates electrically-deployable tray tables covered in black leather with integrated USB ports and cupholders. There’s also a chiller compartment and increased rear stowage. The headphone stowage trim can be removed to reveal a ski hatch whilst the entire rear console can be illuminated according to the vehicle’s mood lighting settings. The driver and front passenger get massage seats with memory and 18-way adjustability. Rear passengers benefit from the addition of lumbar massage and powered recline, a calf rest for the rear passenger side occupant and solar-attenuating privacy glass. You can set the intensity and colour (10 colours to choose from) of the LED mood lighting, which is concentrated on the door handles and stowage compartments, as well as following the lines of the veneered surfaces on the centre console. Leather-wrapped are the seat backs, ski hatch, parcel shelf, the lower sections of the A-, B- and C-pillars and the upper D-pillar. The door inserts are finished in perforated leather. Tread plates are illuminated with ‘Autobiography Black’ script and there’s a brushed stainless steel tailgate finisher. Three exclusive colour combos are available on the Range Rover Autobiography Black at launch: Ebony/Lunar, Espresso/Tan and Dark Cherry/Ivory – the latter including a unique two-tone seat. Lunar/Cirrus will join next spring, when a unique Poltrona Frau seat design in Navy/Ivory also becomes available. 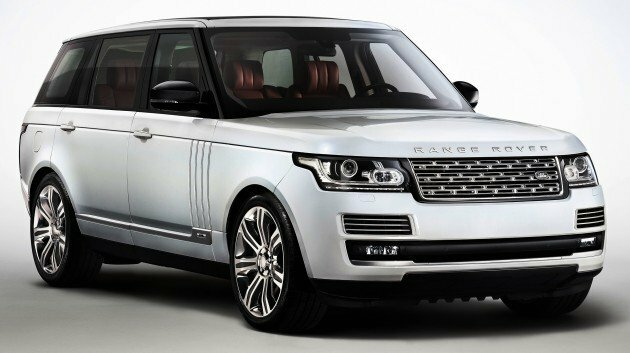 Deliveries are set to begin from March 2014 for the long-wheelbase Range Rover and August 2014 for the Range Rover Autobiography Black. 2nd row leg room could be better, looking from pics, of course. Look at Vellfire seat design and add luxury, as an option for some customers. Improve on your service first please.. I can get better service at Domino’s at times when speaking to a trainee as compared to your so called “head sales person” of your main branch. Unacceptable considering the price of this car. It is after all a least reliable brand no…? Usually you just troll.. but in this case, you are actually correct. Land Rover does have a very bad rating with reliability and service quality in the recent survey what it is.. I cannot agree with this more!!! 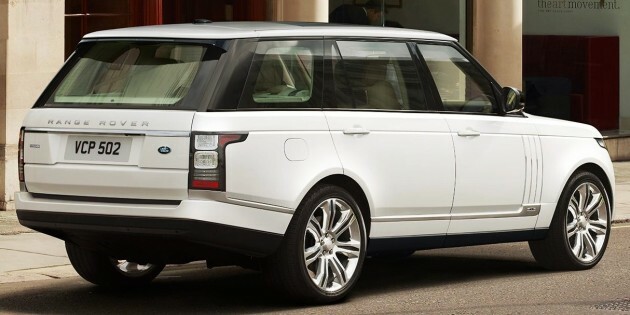 There is something about the Long wheel Base(LWB) that makes the Range Rover looks better. I am not a fan of the way the new Rangie looks outside when compared to the last one, the last has a certain British stance/presence or authoritative look that the new one just lacks(and I can go as far as saying the new one has hints of Japanese in certain ways). The LWB (maybe is the bigger wheels and revise grill)looks much more presentable than the normal version, a better proportion maybe. The Interior may rival the new S-class for my most opulent interior of the year. Nothing short of amazing and represent British luxury at its finest. Russian mafia definitely buying it. More heavy weapon to put behind this car. Great! Why the promo pic is left-hand-drive model ? Its from UK its suppose to right-hand-drive !! Now you can go over (almost) any terrain on earth, and then get to stretch your legs as you camp in the car. Any mention the weight penalty for the extra length? Tokay, kasi bungkus tiga, ikat tepi..
the interior look cramp albeit the car is longer. Occupant cannot move around simply. Prefer vellfire. There is no point to buy this car. Joker of The Day…! SUV vs MPV…!